Zombies, Run! 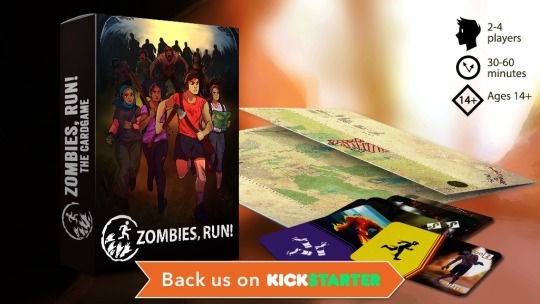 The Board Game is Here – Zombies, Run! Today’s the day: We’ve launched Zombies, Run! The Board Game on Kickstarter! Two years ago, we set out to bring everything you love about Zombies, Run! right to your tabletop and we hope you’ll agree that all our hard work has paid off. Immersive audio story. Fast-paced co-operative game play. Incredible art by Kascha Sweeney. We have it all. Have you ever wanted to be like Janine and create a daring plan to save the day? Or delve into the deeper mysteries of the apocalypse like Maxine? Or pull together bravely with your friends like Sam, Jody and Five? With Zombies, Run! The Board Game you can do all this and more for under $35 US. We’ve got all the details about how the game works, what it’s like to play, and what’s in the box, all on our Kickstarter, so please check it out!